The only tricky part of learning how to make a rock candle is getting the hang of drilling a hole through a flat rock. Once you master that skill, it's easy to create wonderful, natural-looking candles that quickly become conversation pieces. 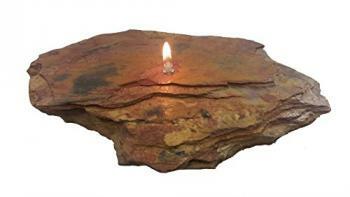 A rock candle uses an oil-burning wick that runs through a flat rock or piece of slate. This gives the illusion that the rock is providing the flame. Follow a few simple steps to make a cool rock candle. Find solid rocks that can withstand drilling without splitting. Granite and slate are popular choices and can be drilled easily. Select a relatively flat rock, so it can evenly rest on the oil reservoir and not tip over. The rock can be as thick as you like, just remember, you will have to drill through to the other side. You need a drill press to create the wick opening for the oil candle. If you don't own a drill press borrow or rent one. You can save time and money by drilling several rocks to use later. Using a permanent marker, indicate where the wick hole will be drilled. Mark a vent hole close to it. The vent hole will be much smaller. The glass tubes come with a collar that is wider than the tube. The allows a flush fit. It also means that the collar will be larger than the hole you drill. Select the drill bit based on the size of the glass wick tube. For example, to drill a 6 mm glass tube opening will require a drill bit that is approximately the same size. (The closest drill bit size is typically 6.1mm for a 6 mm tube.) The glass tube collar is more than adequate to cover a slightly larger hole. Secure the stone in a vise attached to the drill press to prevent it from slipping during the drilling process. Use builder's putty to create a water well around the drilling hole. You want the well deep enough to keep the drill bit submerged in water. Add enough water to fill the drilling well. You must keep the drill bit cool with water. Place a bucket underneath the drill press to catch any water overflow when the drill breaks through the rock. You are now ready to assemble your rock candle. Glue the glass container to the bottom of the rock using heat-resistant glue. Allow the glue to dry completely before continuing. Use the funnel to fill the glass reservoir with lamp oil. Place the glass wick tube into the larger hole you drilled. Feed the candle wick through the tube so the end is resting in the oil. Trim the exposed end of the wick to 3/4" above the rock surface. Your rock candle is ready to be lit. Use the funnel to refill the oil whenever it burns out by removing the glass tube and wick. If you don't enjoy gathering supplies, you can always purchase a rock candle kit. The rock candle starter kits offered by Pepperell Braiding Company come with everything you need to make rock candles, except the rock, drill, and glue. You receive a tin fuel reservoir, a plastic funnel, fiberglass wick, and four sizes of thermal glass tubes. These kits can be purchased at many craft stores, or online at places like Essoya. There are several kits available. For example, the typical kit includes a glass reservoir, funnel, fiberglass wicks, and glass tubes, and a starter bottle of blended lamp oil. Also included are various trade secrets and tips and crafting instructions. You can also purchase a kit that will make 12 rock candles. 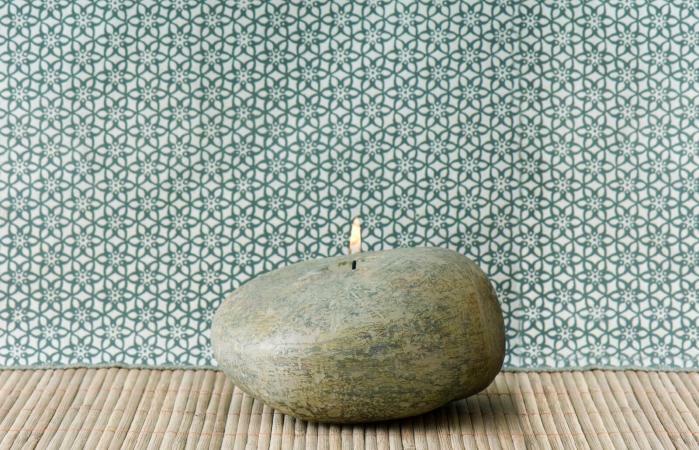 You can use your rock candles indoors and outdoors for a warm glowing ambiance. Be sure to keep pets and children away from open flames and never leave a burning candle unattended.